Follow these tips to prep your grill before you use it or before you store it. It’s important to thoroughly clean your BBQ or outdoor grill before you store it for a prolonged period of time. 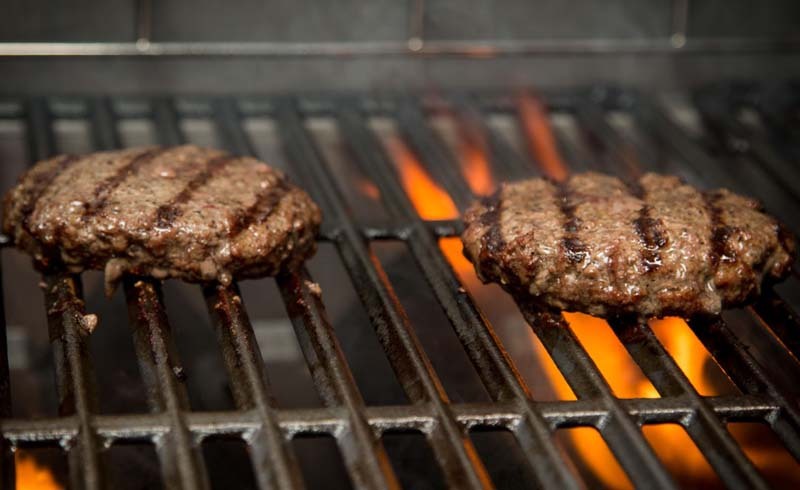 Not only does cleaning the grill help prevent bacteria and pests from establishing a home inside the grill, cleaning is an excellent way to help maintain this appliance over time. Before you put your grill away for the season, be sure to follow these cleaning and storage tips. Before you begin cleaning the grill, be sure to read your manufacture’s recommendation for cleaning as it may differ from below. Burnt on food and grease is often cleaned best while it’s hot. Turn on your grill and let it heat up for about 10-15 minutes. Then turn off the heat and use your grill brush to remove stuck-on foods from the grate. Once cooled, you may need to further wash them to remove all of the grease and food. Don’t forget to clean the upper grate if there is one. Once clean and dry, oil or season the grill grate to help protect it over the winter. 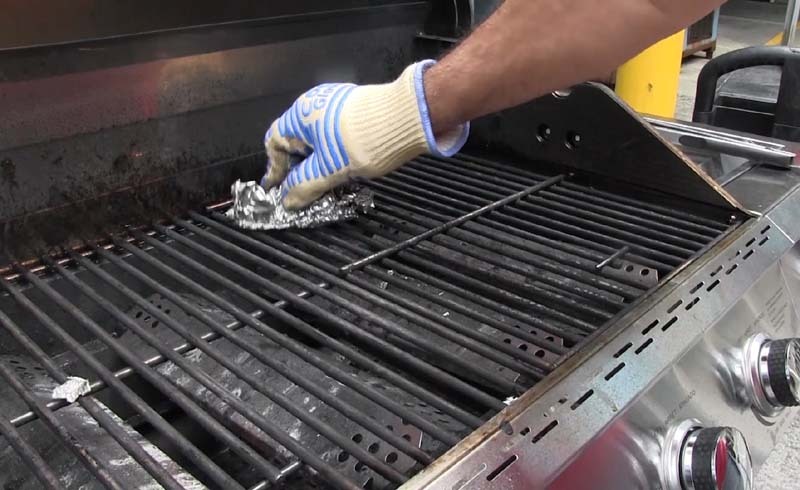 Here are more tips for cleaning and maintaining the grill grate. Once the power is off and the grill is cool, place a tarp or drop cloth under your grill to help catch greasy food and debris, which can stain your patio floor. Next, for long-term storage, it’s a good idea to disconnect the fuel source. You can help prevent spiders or insects from making their home inside the tubing by wrapping it in plastic wrap. For charcoal grills, remove all ashes from the BBQ and place into a metal bin. Never remove ashes while they are still warm. If you use untreated wood chips or charcoal without any added binders or chemicals, you can add cold ashes to your compost bin. But only add about a cup of ashes for every square foot of compost material as it could raise the pH levels too high. Read more about what you should (or should not) add to your compost. Under the grill grate is where food and grease tend to drip and drop, and it’s important to remove and clean these parts as well. The flame tamers are the roof-shaped pieces of metal that sit on top of the burners. Remove and clean the flame tamers (or flame shields), taking care to remove grease and grime. Some gas grills have removable burners and Venturi tubes; the Venturi tubes help mix air and gas and very often spiders can make a nest inside the tubes. While cleaning these parts, check for blocked or rusted holes. Blockages in the burner or Venturi tubes can cause unintentional fires so it’s important to clean these on a regular basis. Always read your owner’s manual before removing the burners or Venturi tubes as improperly reconnecting them could be hazardous. Leave the burners attached if you don’t know how to remove or install them properly. Food and grease can fall inside the cavity of the grill and you’ll want to clean this out as well. It may be easiest to brush it out the bottom and onto your tarp. Any stainless steel parts can be cleaned with a stainless steel cleaner and rag. It is not recommended to use an oven cleaner as it may harm the surfaces and the chemical residue is very harmful for the lungs. For charcoal grills, be sure to remove cold ashes from the bottom as they can draw moisture during the winter. Use a rag to wipe down the inside cavity. The exterior of your grill should also be cleaned. Use a stainless steel cleaner (or a vinegar solution) to remove grease and dirt from the exterior. There are special cleaning solutions for plastic or you can use warm soapy water. Moving parts may work better with a little WD-40 lubrication. This lubricant can also help prevent rust and can help remove and prevent fingerprints on stainless steel. Your propane tank can be disconnected from the gas grill and stored over the winter. Tanks should always be stored upright on a flat, dry, non-flammable surface like concrete. Water, especially standing water, can rust the tank so keep the tank off of wet grass or dirt. Store the tank in a well-ventilated area outside where there is little traffic to potentially knock it over.